For a drama tackling financial woe, it came off more as a tame beast BUT still watchable, none the same. Financial TV host Lee Gates (George Clooney) and his producer Patty (Julia Roberts) are put in an extreme situation when an irate investor (Jack O’Connell) takes over their studio. I originally avoided this at the cinema. The trailers did nothing for me. After the dense but hard hitting arrival of The Big Short, I thought this was going to be a cheap rip off jumping on the band wagon. BUT old Ma and Pa told Mr Over Critical to give it a go AND . . .
After 15 minutes, I was ready to switch it off. I know there are OTT financial shows like Money Monster in real life BUT watching Clooney strut around a news studio with a golden top hat to a bit of R ‘n’ B did nothing to win me over. It tried to be like The Newsroom. The script desperate to deliver that quick pitter-patter that only Aaron Sorkin can master. I know Clooney’s arrogant protagonist was supposed to be smug BUT I really didn’t like him. Roberts was on the side lines far too much and a gag involving erectile dysfunction cream among the crew almost had me change the channel there and then. It was all a little too disjointed. The film kept flicking back and forth to random places all over the world with no explanation. I was struggling to keep up. Once Jack O’Connell made his introduction, my interest was finally peaked and what ensued was a highly watchable and engaging little thriller. I’m not the biggest fan of the Skins star. Don’t ask me why, there’s just something about him. BUT his performance was fantastic. He stole the show and once Lee (Clooney) realised the abuse of his own power, things really got going. It was quite tense as he tried to negotiate with the volatile Kyle (O’Connell) on live TV. Clad in a vest of Semtex with the world watching. The questions piling up as the news team tried to seek out any information on their captor. I was relieved when Roberts was brought into the fold. Working that Ocean’s Eleven magic with Clooney yet again. It wasn’t long before we discovered that Kyle had lost all his money investing in the wrong company. All thanks to a certain TV show. BUT his anger wasn’t just at his own loss. It was at the very corporation who got away with it. Millions of stockholder’s hard earned cash lost because of a ‘glitch’. No explanation. Nothing. As the mystery unfolded, Lee faced a crisis of conscience (making Clooney a lot more tolerable and likeable). It was interesting how the tide changed from a single search for answers to a quest for justice. The supporting cast delivered somewhat of a mixed bag. Caitriona Balfe’s (Outlander) performance left a little to be desired. Her Irish/American twang didn’t help matters and I’m not sure whether it was the lines or her delivery BUT she made the character a lot flatter than she should have been. A shame considering how instrumental her character became as the team discovered more than they bargained for. Breaking Bad’s Giancarlo Esposito was completely wasted in his role as Captain Powell. Anyone could have played him. Emily Meade (NERVE) made more of an impression in those five minutes as Kyle’s pregnant girlfriend. The dumbing down of the financial guff made it easily accessible and understandable BUT still tapped into that Big Short territory. The political speeches aimed at the big wigs were a little hammy in parts. I say big wigs. The whole of Wall Street personified in the form of McNulty from The Wire. Sorry, Walt Camby. A greedy CEO with no S.O.U.L. Dominic West played the part of the sleazy exec well. It may have been a little OTT as Lee brought the show right to the ruthless crook’s doorstep BUT it still hit home. Raising valid points and questioning how these corporations could play with people’s money with such ease. No restrictions, no regulations. Shocking. 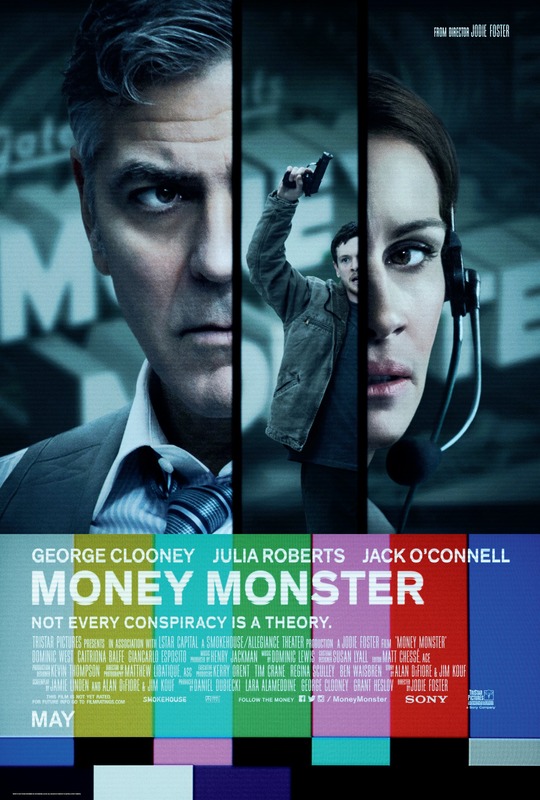 Despite a stuttering opener, Money Monster overcome its hurdles to deliver a satisfying and emotional finale as everything came to a head with a long awaited confrontation that pieced together all the disjointed scenes (That were bugging the hell out of me). Worth a gander if you’ve got 90 minutes to kill. The dares may have been nail biting BUT the cliched dialogue and cheesy moments got on my NERVES! It’s like truth or dare BUT without the truth. So it’s dare. Just say dare. Instead of people playing Pokemon Go, we have idiots taking videos of themselves lying on train tracks and hanging off scaffolding for views and likes. I didn’t even realise that was adapted from a book until my mate told me. BUT after watching this mixed bag, I’m NOT sure if I will seek out the original source material. From the moment the film began with that nauseating first person PoV of Roberts’ Vee (Short for Venus. Don’t worry, we’re told numerous times. Just in case we forget) perusing her Facebook page, playing “The Only Single Person of her Friends” Spotify playlist and whining about going to college, I didn’t know if this would be for me. Roberts (Scream Queens) was a likeable presence and the pace zipped along. It set up her cliched back story quite quickly and you could relate to her social awkwardness and inability to tell her financial stricken mother that a local college might NOT be in her plans. And it wasn’t long before the NERVE-ous teen (What?) was introduced to the latest viral craze. Emily Meade (The Leftovers) made a memorable turn as Vee’s attention seeking and insecure “BFF” Sydney. Her incessant nitpicking goading Vee to break free from the lonely ranks of the “WATCHER” and take on life as a “PLAYER”. A shame the same can’t be said for the rest of the supporting cast. Juliette Lewis (Natural Born Killers) was wasted in her role as Vee’s mum. Their relationship wasn’t really explored enough (or at all for that matter). There was so much potential BUT it was all thrown away for the game. Miles Heizer (Parenthood) was funny as Tommy. The poor chap who can’t accept Vee’s “friend zone”. BUT once Dave Franco (Now You See Me 2) hit the scene, his snarky one liners and quips were reduced to phone in conversations. Only returning for the finale. The whole concept of NERVE was intriguing and was a fantastic satire ripe for poking fun at the idiocy that all these social media platforms bring (as well as the dangers). BUT for the first 30 minutes, it was just too damn corny. Despite NERVE focusing perfectly on the addictive nature of a new craze with Vee enjoyed living a little and gaining fans, I could feel my patience wading. Franco’s introduction picked things up a bit and he managed to drudge through some of the more nauseating moments. BUT I had to cringe at the lad miming badly to Roy Orbison and prancing around the diner for a dare. BUT while this was all going on, I kept wondering why this film got a 15 rating in the first place?! Kiss a guy for 10 seconds. Wear an expensive dress. Get a tattoo. Really? Luckily the pair had good chemistry and kept things watchable BUT I was still left wanting. HOWEVER just as I was about to give up on this cheesy teen flick, the game took a turn for the worse. As Vee became a viral sensation, the dares soon became more challenging leading to a tense adrenaline pumped second half. The true danger of social media. A white knuckle motorbike ride had me wincing throughout as Vee guided a blindfolded Ian (Franco) across a busy traffic riddled New York street. BUT that didn’t make me feel quite as queasy as the ladder dare. A rattly ladder pinned between two buildings with a nice 20-30 storey drop. No thank you! And to make matters worse, the opponent must film the whole thing on their phone while doing it. The camera angles and first person perspective tested my vertigo a treat. Frantic, suspenseful and mental. A rewarding half that almost paid off as things came to a head. BUT this was where it let itself down again after all that promise and tension. Vee and Sydney’s friendly battle for views became more competitive BUT it led to nothing more than a bitchy ‘slanging’ match. Shame. And that was the problem. This could have been so much darker. It was far too corny for its own good and despite these mental challenges and satirical commentary, it rushed everything for a frantic and abrupt finale that delivered a hammy sermon on the woes of trolling and illegal online activity. I could respect the message BUT the timing and delivery was dreadfully dull and killed a lot of the suspense. A mixed bag. I could think of worse ways to kill 90 minutes. A watchable romp BUT not quite what I hoped. And now for my next trick. Watch a franchise that nobody wanted . . . DISAPPEAR! The Four Horsemen resurface and are forcibly recruited by a tech genius to pull off their most impossible heist yet. Now You See Me was an enjoyable romp. Hardly ground breaking BUT easy going fun with a group of magicians hustling some rich conglomerates. I didn’t expect the finale and was even more surprised when a sequel was confirmed. I hoped the next outing would carry that same level of energy and fun BUT this was utterly dreadful. Irritating characters, drawn out pace, a terrible story line, farfetched stunts that pondered all levels of plausible acceptance and really shoddy CGI made this one to avoid. It’s not essential to watch the first outing. You get the entire plot summarised in the first 30 seconds. The opening showed promise as we explored Dylan’s (Mark Ruffalo) past and the reason behind his rivalry with Thaddeus Bradley (Morgan Freeman). BUT once it flashed forward to the present, the intrigue was lost. Eisenberg’s Atlas was far too serious and sulky. I don’t know whether he was still getting over losing his hair for the shambolic superhero saga that was Batman vs Superman BUT his griping and silly backstabbing antics were dull as dishwater. We had a new Horseman, person or Female Horseman (Whatever) in Lizzy Caplan (Mean Girls). I thought she would be a worthy addition to the mix. BUT she was incredibly annoying. She wasn’t funny and her verbal diarrhoea was insufferable. I think Isla Fisher made the right decision not to come back. What didn’t help was the agonizing pace. The film should have been cut by a good 30 minutes. Mark Ruffalo (Avengers) was the most interesting character and he was barely in it! Every time Dylan appeared, things happened and I was hooked. I was happy to follow his subplot NOT the Horsemen. Battling to keep his cover under the watchful eye of Sanaa Lathan (who was wasted in her role). Proof in the pudding when one of the best scenes was Dylan causing havoc in a Chinese street brawl. The fight sequences combined with a series of magic tricks were well choreographed and stopped me fidgeting in my seat. I have to admit the Horsemen really did infuriate me. Woody Harrelson had been on resurging form with his recent endeavours (True Detective) BUT this was a complete misstep. He went full retard as Merritt’s twin Chase with his Will Ferrell-esque wig and badly capped teeth. An unnecessary character that tested me in every scene. Dave Franco (NERVE) did his best with his role BUT was lost in the mix. Eisenberg eventually lightened up and delivered his usual schtick BUT it was too little, too late. You know you’re onto a loser when Morgan Freeman’s dulcet tones are doing your head in. His silky voice couldn’t save this leaden script. If anything, it highlighted the clunky exposition. A revelation about Bradley unintentionally undermined pretty much a good portion of the premise from the first one. Daniel Radcliffe wasn’t too bad as the weasely Walter Mabry. He played the slimy techno villain well BUT he wasn’t in it enough. NOT even the return of Sir Michael Caine did anything for me. He was laughable. Doing his best Victor Meldrew impression. Dismal. What made matters worse was that the actual hustle and magic tricks were far too OTT and farfetched for my liking. I know it’s only a movie BUT some of the big reveals defied physics or common sense to work even in a Hollywood universe. An elongated card flinging sequence took the biscuit. Watching the gang flick a badly CGI’d card in the air and around their torsos to smuggle a computer chip was just plain terrible. However, the finale delivered a little of what I expected from the get go. The effects actually did impress; especially when Eisenberg disappeared into a puddle of rain. Tense, engaging and watchable. WHERE WAS THIS FOR THE REST OF THE FILM? !